The 2016 presidential campaign has been everything except predictable. 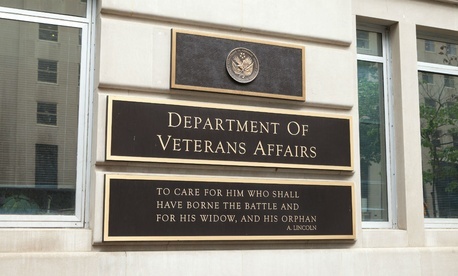 But we can count on one thing: At any given moment, an Oval Office hopeful somewhere is screwing up the name of the Veterans Affairs Department. Both Republican and Democratic candidates consistently call the Veterans Affairs Department the “Veterans Administration” during debates, rallies, town halls and other public remarks. That would be fine if it were the 1980s, and Ronald Reagan were president. But in March 1989 – nearly 27 years ago -- the Veterans Administration was renamed the Veterans Affairs Department. (Reagan elevated the VA to a Cabinet-level department in October 1988, and the change took effect in March 1989 under President George H. W. Bush.) Yet current and former 2016 presidential candidates – many of whom have served in public office for some time – can’t quite seem to get the name right. “I will fight to protect and preserve the Veterans Administration.” – Democratic Sen. Bernie Sanders during the Feb. 18 MSNBC/Telemundo town hall. Sanders is a member of the Senate Veterans’ Affairs Committee and is a former chairman of the panel. “I'd like to ask all the veterans listening out there tonight, who are waiting in line for healthcare, who are literally dying because the Veterans Administration doesn't work, do you think Barack Obama knows what he's doing?” – Republican New Jersey Gov. Chris Christie (who dropped out of the presidential race earlier this month) during the Feb. 6 Republican debate in Manchester, N.H.
“Career civil service reform would allow the next president to fire people that are — that are showing sheer incompetence. At a town hall meeting today, someone came — told a story of their father who looked like he was 85. He had — he got a bill eight years later from an operation he had, eight years it took. They couldn't resolve the dispute and then he was told that he died. Literally, the Veterans Administration sent a death certificate to this guy and it took nine months to clarify the guy — I met him.” –Former Republican Florida Gov. Jeb Bush (who dropped out of the race this past week) during the Feb. 6 debate. Interestingly, Bush referred to the “Department of Veterans Affairs” just a few sentences earlier. “I’m here on the floor today to talk about an issue that has received a tremendous amount of attention and rightfully so over the last few weeks, and it’s the outrage over what’s happening at the Veterans Administration.” – Florida Sen. Marco Rubio, in May 2014 on the Senate floor (well before the presidential campaign got underway), discussing accountability at the department right after the news broke about the wait-list problems affecting veterans in Phoenix, Ariz. So, why all the confusion? It could be because VA’s three major sub-components have “Administration” after their names: the Veterans Health Administration, Veterans Benefits Administration, and the National Cemetery Administration. VHA and VBA, in particular, are in the news regularly, and they are the organizations that vets have the most interaction with. VA ceased to be named the Veterans Administration on March 15, 1989 when President Ronald Reagan elevated it to a Cabinet-level department. At that time, VA became the Department of Veterans Affairs. Clearly, lots of people need the reminder, including news organizations. Fox News and CNN have both called the department the Veterans Administration on occasion. The federal government is a vast and labyrinthine place, full of countless programs, policies and acronyms. We’re all human -- even politicians -- so we misspeak, or confuse agencies (or forget the ones that we want to eliminate). But if you’re running for president, and you want to reform a major department with a vital mission (and a 300,000-plus workforce), you should probably take the time to get the name right.